This notebook illustrates some of the behaviors of the singular value decomposition of time series data. I've written it in part as a response to a paper by Andrew J. Reagan, Lewis Mitchell, Dilan Kiley, Christopher M. Danforth, and Peter Sheridan Dodds recapitulating an argument first made by Matt Jockers: that certain kinds of eigendecompositions of sentiment data from works of fiction will reveal "fundamental plot structures" or "fundamental narrative arcs." I have doubts about that argument that I discussed during the wave of debates inspired by Annie Swafford's initial critique. At first glance, Reagan et. al. seem to address some of those doubts. But after going over their paper more carefully, I have come to an even more skeptical conclusion: I think that if they have shown anything at all, they have shown that sentiment time series data from works of fiction is best modeled by a particular kind of noise. If that's correct, it's a strong indication that researchers in this area should shift their attention away from grand generalizations and towards more local inquiries. However, it might also validate some aspects of Jockers' original program, because it could provide some very weak evidence that the space of sinusoidal curves may indeed provide the best representation of sentiment time series data. Whether it does so remains an open question, because we don't know enough about the methods Reagan et. al. used. Although I'm making it public now, this notebook is a work in progress, and I would appreciate feedback of any kind, as well as citations to other work that covers similar ground -- which I am sure exists, but haven't yet found. I am indebted to Annie Swafford, Dan Lepage, Matt Jockers, Molly Des Jardin, Beth Seltzer, and Lindsay Van Tine for their extensive comments on earlier drafts of this notebook. In my initial response to Jockers' work, I emphasized that we had no particular reason to assume that a sinusoidal decomposition would reflect anything meaningful about plot. Until we could justify that assumption, I argued, we could not draw meaningful conclusions from Jockers' method, which used a Fourier series decomposition to produce sine waves of sentiment. Without knowing what a sine wave of sentiment was, we could not know how to interpret the results. But Reagan et. al. use a different approach. They take the singular value decomposition (SVD) of sentiment time series data that they extracted from many hundreds of works from Project Gutenberg. Because the SVD places fewer restrictions on the structure of the decomposition that it produces, their approach avoids making the same assumptions. When I saw that the SVD also produces sinusoidal functions from their sentiment time series data, I was startled, and began to reconsider my position on Jockers' original work. It turns out that there really may be a reason to represent sentiment time series data as a sum of sine waves. The reason is given by the Karhunen-Loève theorem, which shows that the canonical form taken by the SVD of a particular kind of noise, Brownian noise, is a set of Fourier-like sinusoidal functions. So using Fourier transforms to smooth sentiment data may be justified after all. But if so, it's justified because sentiment data behaves in the general case like plain, perfectly unpredictable Brownian noise -- that is, noise produced by random walks. We can't yet know for certain whether sentiment data from fiction really behaves like Brownian noise. It's possible that the sinusoidal shapes that Reagan et. al. report are merely side-effects of their smoothing process. The results they report may provide some weak evidence against that conclusion, but not enough to be convincing: almost all of the results they report are also consistent with the results one sees from aggressively smoothed white noise. The following code and comments show that many of the results reported in Reagan et. al. can be reproduced simply by transforming Brownian or white noise. I have not reproduced every result reported in the paper; the self-organizing map they create, in particular, is difficult to interpret or validate, and I haven't tried to reimplement it here. But the other results they report are easy to recreate with randomly generated data. The most compelling argument they provide for their thesis relies on the way the SVD differs when "word salad" sentiment data is substituted in place of data from the original texts. But as I show below, those differences can be replicated simply by rescaling the original data. Furthermore, there's evidence that if there really were fundamental narrative arcs that were not explained by the properties of Brownian noise, they would likely be revealed immediately by the SVD. To show this, the code below generates a set of fixed arcs and adds Brownian noise to them. The SVD of the resulting data produces complex base shapes that are obviously non-sinusoidal. The fact that no such functions appear among those shown by Reagan et. al. strongly suggests that if there are indeed fundamental narrative arcs, they are almost purely sinusoidal, and have no particular significance except as signs of Brownian noise. None of this necessarily means that there are not any fundamental plot structures. Nor does it necessarily mean that there are not other "laws" of plot that we have not yet discovered. It does suggest, however, that by continuing to analyze sentiment time series data this way, we are barking up the wrong tree. The sinusoidal curves Reagan et. al. found may be nothing more than smoothing artifacts. But even if they are more than smoothing artifacts, they are easily explained by the simple hypothesis that the sentimental arcs of works of fiction are, in general, random walks. To produce findings of any additional significance, researchers will need to show phenomena that cannot easily be explained by that model. On the other hand, the structures of fiction belonging to particular genres, of fiction written at particular times or places, and of fiction created by particular writers or schools of writers may not be modeled by random walks. 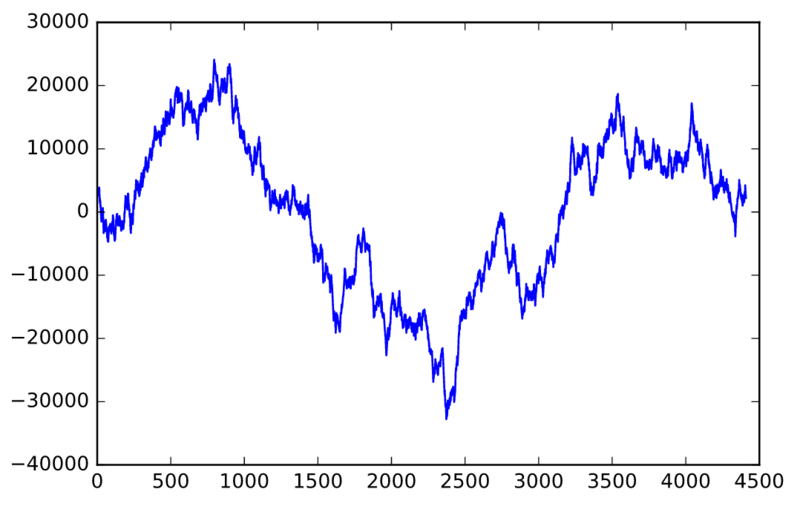 If correct, the random walk model might even lead us to expect local regularities at a given scale of analysis. Patterns of imitation and historical influence might be traceable using sentiment analysis, especially now that the method is being more thoroughly validated by human readers. It might even make sense to use Fourier transforms to do the tracing, contrary to what I previously argued. But the random walk model provides no reason to believe that those patterns will be predictable over the long term, or have any regularities that justify grand generalizations about Homo Narrativus. Rather than continuing to look for universal laws where there probably are none, we should start producing historically informed work based on these tools. Now we can perform singular value decomposition on the samples generated above. The shape of the basis vector functions is not predetermined; if you pass in white noise, they also look like white noise. But if you pass in Brownian noise, they look just like the basis functions of a Fourier series. These basis functions are guaranteed to produce the best approximation of the input, even when truncated; that's the essence of the Karhunen-Loève theorem. Let's also verify that the SVD operation has produced reasonable results. Then we can start plotting eigenfunctions. Here are a few of the most significant basis functions. They might be a little off -- frequently they are not centered in the way one might expect. But they consistently look like sinusoidal curves with increasing frequencies, maybe with a bit of peach fuzz. They are almost identical to the functions that Reagan et. al. show in their paper. The above plot indicates how significant each of the basis functions are. As you can see, their significance drops off rapidly. According to Reagan et. al. the difference between these two lines indicates "less important ordering of the singular vectors." But I've reproduced it here just by rescaling the input. There are 7 clusters at a distance threshold of 8000000. Cluster 0 has 290 items. Cluster 1 has 483 items. Cluster 2 has 178 items. Cluster 3 has 300 items. Cluster 4 has 173 items. Cluster 5 has 343 items. Cluster 6 has 233 items. The results aren't as stable as those produced by SVD -- they change a little bit every time this notebook is run. This method seems to be more sensitive to horizontal translation, creating clusters of samples that are similar, but shifted to the right or left. Still, they are reasonably similar to the SVD curves, and they are also quite similar to those that appear in Reagan et. al. As you can see from the horizontal axis, the distance between clusters is now an order of magnitude smaller, just as in Reagan et. al. That's not surprising, because we divided the amplitude by ten. Given that several of the major results that Reagan et. al. reported can be replicated with Brownian noise, it's worth looking at the SVD of other kinds of time series data to see what a really surprising result might look like. Let's begin with white noise. White noise differs from Brownian noise because Brownian noise has correlations that depend on distance, while white noise does not. In Brownian noise, samples that are close together in time are more likely to be similar in amplitude. But in white noise, samples that are close together are completely independent. White noise seems unlikely to be a good model for sentiment data from a coherent narrative, but it's worth investigating if only to show the range of sensitivity of SVD-based methods. Indeed, it turns out that when you perform SVD on white noise, the basis functions are just more white noise. No more curvy eigenfunctions -- just static. These are white noise signals filtered with a Gaussian filter, which helps to ensure that the result won't be pure white noise. It's hard to tell the difference between this and plain old Brownian noise, right? But the SVD gets it right away. These still have a quasi-sinusoidal character, but they diverge noticeably from the neat, clean curves generated by pure Brownian noise -- and by the data in Reagan, et. al. Smoothing has interesting effects on these outcomes. Those effects raise questions about whether the input data that Reagan et. al. use even has a Brownian structure. The time series data they use in their analysis is smoothed using a simple moving average; their method has a few subtleties, but it boils down to a square low-pass filter -- that is, a filter that blocks high frequencies while allowing low frequencies to pass, and that weights samples from a block of time equally. When abused, that kind of filtering can introduce a Brownian signature into data that doesn't already have it. Much of the detail in this section was inspired by conversations with Annie Swafford and Dan Lepage, whose thoughtful feedback helped me make sense of potential smoothing problems. Remaining errors and controversial opinions are my own. Suppose the raw sentiment data that Reagan et. al. used was nothing more than white noise. Using a relatively mild filter, here's what it would look like. On the surface, it doesn't look so different from the Brownian noise samples we began with. But what does the SVD do with it?